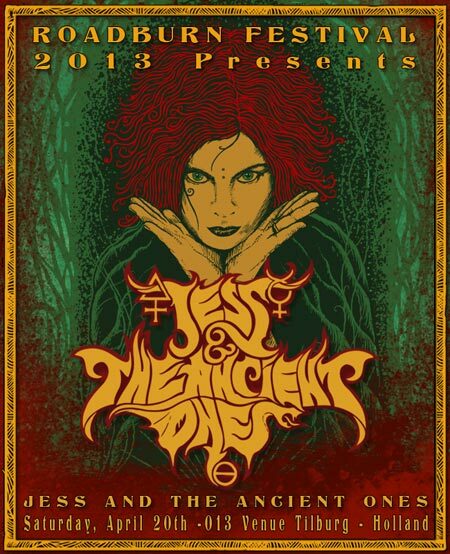 Roadburn, in collaboration with Blow Up That Gramophone and Svart Records, are excited to announce that occult rockers JESS AND THE ANCIENT ONES have been confirmed for Roadburn Festival 2013 on Saturday, April 20th at the 013 venue in Tilburg, Holland. Hailing from Kuopio, Finland, JESS AND THE ANCIENT ONES are currently making waves in the underground, drawing their inspiration from (prog)rock groups of the classic era and old school heavy metal. For a more specific recipe for creating their self-titled debut album, take the overtly satanic sermons of genre progenitors Jinx Dawson (Coven), add the guitar genius of psych lunatic Roky Erickson together with Robbie van Leeuwen‘s (Shocking Blue) fuzzy pop sensibilities, stir in the rhythm and drive of vintage Iron Maiden, and top with a web of interweaving guitar duels influenced by the classic Smith/Murray partnership and deeply rooted in 60s and 70s prog and psych. With talented vocalist Jess as their enigmatic frontwoman, the septet will take Roadburners on a devastatingly rapturous journey through the self, the astral and the arcane consummated by those transcendent vocals, and this trio of rich guitars. If that doesn’t kindle your desire for a vociferous satanic ritual, we don’t know what will! SUNWØLF: New Album ‘Beholden To Nothing And No One’ Out Today!